Born in Mersyside, Peter Turnbull studied at Chester College, Nottingham College of Art, The Royal College of Art in London and in Paris. Following graduation in 1978 he has exhibited widely both nationally and internationally in solo and group exhibitions in the USA, Europe and England. He has lectured widely on art in academic institutions, educational authorities and museums, and from 1982 to 2005 was Head of Fine Art at the University of Chester, becoming Visiting Professor of Fine Art upon early retirement. His subjects range from intimate interiors, hinting at human relationships, to elemental landscapes both familiar and timeless. Meticulously prepared materials enable the creation of a subtle palette of richly subdued tones. The artists apparent relationship with his local landscape is manifested through translucent vistas of light, with a copse of trees or turbulent sea spray demonstrating his understanding of his medium and traditional techniques of English painting in both an historical and contemporary sense. Though his palette is restrained and subtle, his meticulous preparation and controlled technique allow him to make work which has considerable intensity. There are effects of dappled light and mist which create a mood of ambiguity- a contemplative melancholy. 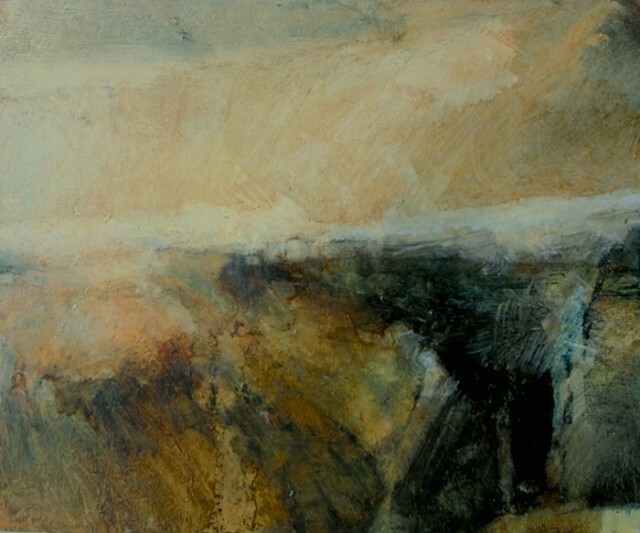 His deep knowledge of the history and techniques of landscape painting, allows him to forge a sense of connection and continuity with the past whilst he is agile and perceptive enough to express a contemporary and compelling sensibility - there is a kind of wounded yearning in these paintings, and a calm acceptance of the simple, quiet solace of beauty. Peter Turnbull has had three successful exhibitions with us at Ffin y Parc, in 2014, 2015 & 2017.